Policy framework from the board for our Superintendent (Broad class of 2006) to use in administering personnel. I made a comment on number one, and listened about number two, but my focus was on number three, and it’s a good example of how to connect your local issue to the larger national context. Our board has been implementing something called policy governance as a means to have clarity about the roles that the board and superintendent play in running the district. It’s one of those things that sounds great (it’ll keep the board from micro-managing and focus them on setting broader policy goals), but it can also be manipulated to allow administration to run their own show with little oversight. There were specific sections of this policy proposal that touched on teacher evaluation. Given where that has been going the last few years, I felt it prudent to apprise the board members of the context. Many of you know that not only are our fellow teachers ignorant of what has been going on with so-called education “reform”, but our elected school board members ban be really out of the loop on these issues. I decided to speak up and share both what has been happening (using student tests to evaluate teachers in other parts of the country), why this was bad, and how they needed to have more clarity in the wording of the policy document to prevent this sort of misuse. As you’ll see in the video (link below). They ended up tabling an item they seemed set to approve without comment. This was important because I was able to turn this vote into an opportunity to educate board members. It was also good because it is much easier to intervene before a questionable policy is put in place, than after. Going forward with Save Our Schools, I think it’s critical that we share these local events. While some of this was particular to my district and how things are set up (policy governance, signing the RttT MOU without having the union sign it), much of what I gathered will be useful anywhere they are talking about using test scores for teacher evaluation. This will give us a common group of resources to work with. At least that’s my hope. At the very least, sharing this we’ll all know we aren’t alone. Video of my testimony on item 10.5 will be about 15 minutes in. The proposal in discussion that I was commenting on. I spoke to this item at last night’s board meeting, and given the late hour, the item was tabled for a later board meeting. I promised some more information for discussion when you meet on this item again. There is a push for tying teacher evaluation to student test scores nationwide. New York and Florida are two high profile states that recently enacted mathematical models for teacher evaluation that rely on student test scores. I am concerned that Coherent Governance Operational Expectations (OE) Policy 4 – Personnel Administration could be used to give authority to create a similar system here in Sacramento. I fear that the language in this policy is broad enough that it could give your authority to administrators to bring in these evaluation systems. The district may have committed yourself to this inadvertently by signing the RttT MOU, which calls for changing teacher evaluation and compensation to be based, in part, on student test scores. Why are these systems bad? The heavy reliance of student test scores has been a factor in many of the growing number test cheating/erasure scandals of recent years. Yong Zhao » Blog Archive » Ditch Testing: Lessons from the Atlanta Scandal (Part 3): Human Nature? If we are looking at changing our evaluation tools this cannot be decided unilaterally, as has been done with the calendar. This would be a contractual change, so agreement is not just a “nice” idea, but legally required. Language MUST be added that states explicitly that the Superintendent will work with employee representatives and that the goals should be in alignment with collective bargaining agreements. Thank you for your time and consideration on this matter. If you have further questions, please contact me. 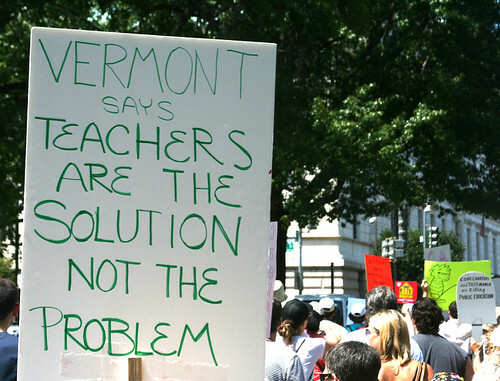 I agree that teacher evaluation should be based on something other than test scores. In addition, growth should be inherent in the evaluation system. I am so determined to try to improve this area that I wrote The Inspired Teacher: How to Know One, Grow One or Be One. In my opinion, the summary charts for each chapter are absolutely suited to discussions with each teacher about where and how to improve teaching skills throughout an entire career. Maybe these would be the foundation that your school board needs to start from. Larry Ferlazzo’s recommended your blog on his site. Thought I’d stop by again and give my 2 cents. Personally, I’ve been to school board meetings and it’s just rather disgusting on how they get their minds set and only care about one thing… themselves. With the new school year starting here in Florida. There has been a lot of things going on with the school board in my county. Mainly, with how they have everything screwed up with transportation… it’s just a big mess. I wish you all the luck in Vermont. Again, great blog and keep up the good work.